All that is known of the origin of Ruby Thursday is that her given name is Thursday Rubinstein. 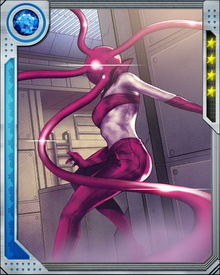 How she came to be transformed into her current shape, with a ruby-colored sphere of "organic circuitry" instead of a head, is unknown. It is also unknown how she came to be affiliated with the villainous group known as the Headmen.